The PlayStation 3's box labels might be changing this year to match the style of its successor and handheld little brother. IGN noticed the change when it received a copy of Deception IV: Blood Ties from Koei Tecmo, and Sony confirmed that this will be sticking throughout the remainder of the PlayStation 3's days. Just be sure to not get confused from here on out. Not too big of a deal, but I am a stickler for having pretty shelves to show of my collection of entertainment. I like uniformity, and I struggle to buy the Greatest Hits versions of games because the box or labels are a different color. Most consoles are easy to build a nice clean library of games, but the PlayStation 3 has been all over the place. This change marks the second time its boxes have been redesigned. The first wave of games from 2007-2009 sported a smaller red label, and Sony reverted back to a slicker black label from 2010 until the present. Now that light blue is in fashion, since the Wii U sports it also, PlayStation 3 boxes will be brought up to date to be cooler with the young kids. In the meantime, my PlayStation 3 shelf will looks like it has gathered a mass of games from three different consoles, and that mean Greatest Hits copy of Dead Space 2 is continuing to laugh at me. Yes, I am utterly insane about these small things, but don't you dare judge me. 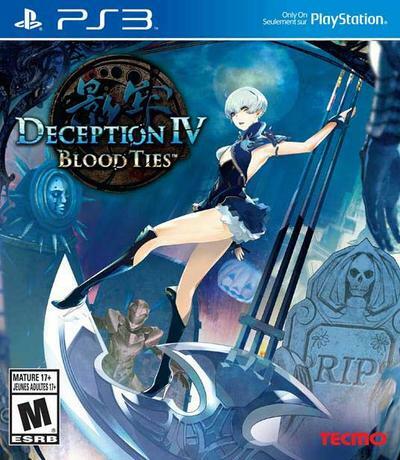 At least the blue is slick, and it matches the cover of Deception IV: Blood Ties, an amazing looking game you should try when it gets released on March 25.